Opponents associate ‘Yamamoto’ with WWII Japanese admiral. Fred Yamamoto was a member of the Page Mill Church Epworth League in 1934. 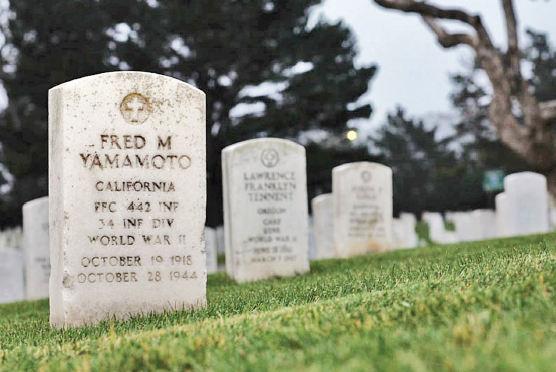 PALO ALTO — Fred Yamamoto, a Japanese American war hero, is one of eight finalists as the Palo Alto Unified School District considers renaming two middle schools. Despite his heroism — the 1936 Palo Alto High School graduate was killed in action in 1944 during the 442nd Regimental Combat Team’s rescue of the Texas “Lost Battalion” in France — some Asian Americans are opposed to honoring him because he has the same last name as Adm. Isoroku Yamamoto, the architect of the Pearl Harbor attack. Jordan Middle School, named after David Starr Jordan, and Terman Middle School, named in part after Lewis Terman, are set to be renamed because both men were leading advocates of eugenics, which is based on the belief that some races are superior to others. Some 500 names, ranging from Gandhi to Steve Jobs, were submitted and the 13-member Recommending School Names Advisory Committee forwarded its recommendations to the five-member PAUSD Board of Education. During a public meeting of the committee on March 19, nearly three dozen community members spoke, most of them against naming either school after Fred Yamamoto, according to Bay Area News Group. The committee said it would relay the comments to the board, which is scheduled to make a selection on March 27. Two of the finalists are places, and two board members have expressed a preference for places over people. One board member suggested a memorial for all six individuals. A group called “Concerned PAUSD Members” launched an online petition on Change.org, which reads, in part: “We appreciate the effort that the Advisory Committee of RSN (Recommending School Names) has made for renaming our two middle schools. We also appreciate that ‘Yamamoto’ was thought of, and even recommended, because we feel that choosing an Asian name could reflect diversity, inclusion, and respect. “There exist certain hurt feeling when the last name ‘Yamamoto’ is mentioned, especially for Asian immigrants whose families were tragically affected in China, Korea, and Southeast Asian countries during World War II. Likewise, to many Americans who were in the U.S. during World War II, this name could remind many of the chapter in our history when Pearl Harbor was bombed … This Japanese admiral is whom many first think of upon hearing the name ‘Yamamoto,’ and our middle schools should never be affiliated with such a person. “There is simply no human being in this world who could be considered perfect in all aspects. Even the idea of perfection itself is different for everyone, because individuals come from a wide range of cultures, ethnic groups, religious beliefs, etc. Naming our public school after a person would undoubtedly raise the risk of wasting time and resources in our community in the future, because new issues with a person may arise. More than 1,000 people have signed the petition. 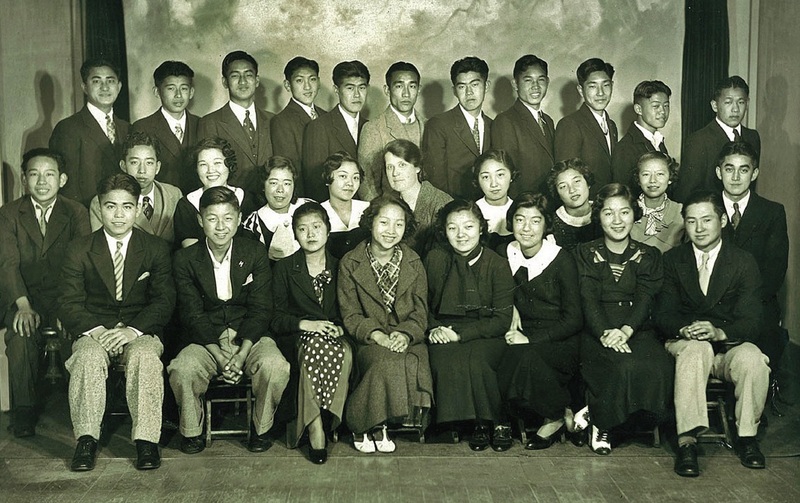 National JACL Executive Director David Inoue, in a March 19 letter to Interim Superintendent Karen Hendricks and members of the school board, wrote: “On behalf of the Japanese American Citizens League (JACL), the oldest and largest Asian American civil rights organization in the United States, I am writing to express our support of honoring Fred Yamamoto with the naming of one of your middle schools. “Part of my job as executive director of JACL is to engage the public with the history of the Japanese American experience during WWII. I have been struck by how far reaching the appeal of the Japanese American story — a story of resilience, courage, and patriotism — is, and how many different communities are able to learn from and be inspired by it. “Mr. Yamamoto’s life and death show a hope and belief in American ideals. In choosing to serve his country that was wrongfully imprisoning him and his family, Mr. Yamamoto demonstrated a profound belief that America’s core values are more than its flawed leadership or an unconstitutional decision, and those values deserved to be fought for. He sought peace abroad to bring it back to his family and the many other members of his community, the Palo Alto Japanese American community who had been unjustly imprisoned. 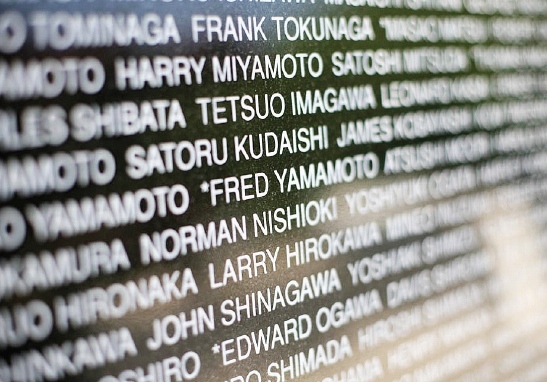 Fred Yamamoto’s name on the Go For Broke Monument in Little Tokyo. Regional Director Patty Wada of the JACL’s Northern California-Western Nevada-Pacific District wrote: “Mr. Yamamoto was not only an American hero, but also someone whose life and death are a testament to the very definition of a loyal and dedicated citizen. 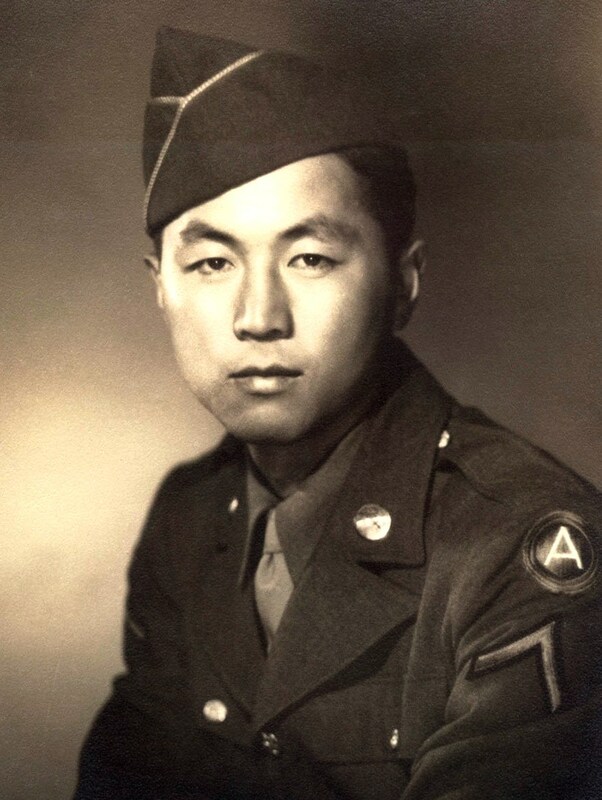 Mr. Yamamoto, a member of the famed 442nd Regimental Combat Team, which served America with distinction and honor, didn’t hesitate to volunteer for the U.S. Army and gave his life for our country in spite of the discrimination and injustice suffered by Americans of Japanese ancestry. “During World War II, over 110,000 people of Japanese ancestry, most of whom were American citizens, were forcibly removed from their homes without charges or trial and incarcerated in the deserts of America, simply because they ‘looked like the enemy.’ Mr. Yamamoto, whose own family was among t hose wrongfully incarcerated, gave his life for our country and for freedom at the age of 26. “Naming a school after Fred Yamamoto, who was awarded the Purple Heart for his bravery, would be a most fitting tribute, but would also provide a valuable lesson for our youth about our Constitution, about democracy, about justice and sacrifice. “American heroes come in all shapes and sizes — regardless of age, gender, race, ethnicity, religion, sexual orientation and physical abilities. The beauty of America’s diversity is an invaluable and critical lesson for students today and generations yet to come. It is disturbing that those who have not yet heeded this very American ideal are fostering intentional misunderstanding and ethnic tensions around this naming. To hear of such attempts is truly disheartening. Brad Shirakawa, who is spearheading the Yamamoto campaign, commented, “Our efforts to honor Fred Yamamoto are based on his accomplishments and the legacy he left, of not allowing hate to color his decision-making process. He could have hated President Roosevelt, or the U.S. government that had imprisoned him. Instead, he chose to fight for America anyway. Yamamoto was a member of Page Mill Methodist Church, the precursor to Aldersgate Methodist Church in Palo Alto. When his family was incarcerated at the Heart Mountain camp in Wyoming, he became a staff member of The Sentinel, the camp newspaper, and was the first to volunteer for the Army. Several members of Page Mill Church enlisted, but Yamamoto was the only one who didn’t come back. Among those he left behind was his sweetheart, Michiko Yamada, whom he planned to marry. Local 442nd veteran Lawson Sakai is expected to speak at the March 27 meeting. The geographic names being considered are Adobe Creek and Redwood Grove. Three years ago my son wrote a book report about his school’s namesake, Stanford’s first president and one of California’s leading Eugenicists, David Starr Jordan. We started the campaign to rename our school, to find namesakes worthy of the honor of having a public school named after them. The ideal name should reflect our values and be inspirational to our students and community. Of all the distinguished candidates Fred Yamamoto has by far the most inspiring life story, given his steadfast belief in our country and his fellow citizens, his belief in freedom and equity, whom he chose to defend with his life. As a community we are humbled, as an individual I am inspired. If I had a vote we would have a middle school named in his honor.